Everybody likes Breaking Bad – the TV show on FX about Walt, the high school chemistry teacher diagnosed with cancer turned meth cook and drug baron. As it turns out, the developers behind the shopping cart plugin for WordPress called WooCommerce likes Breaking Bad just as much as we do and are now referencing the TV show secretly in one of their product exhibition pictures. The Pollos Hermanos Fry Batter was used by Walt & Fring to secretly move crystal meth across the United States. See the item called Pollos Hermanos Fry Batter? It’s available for pickup in Albuquerque, New Mexico. 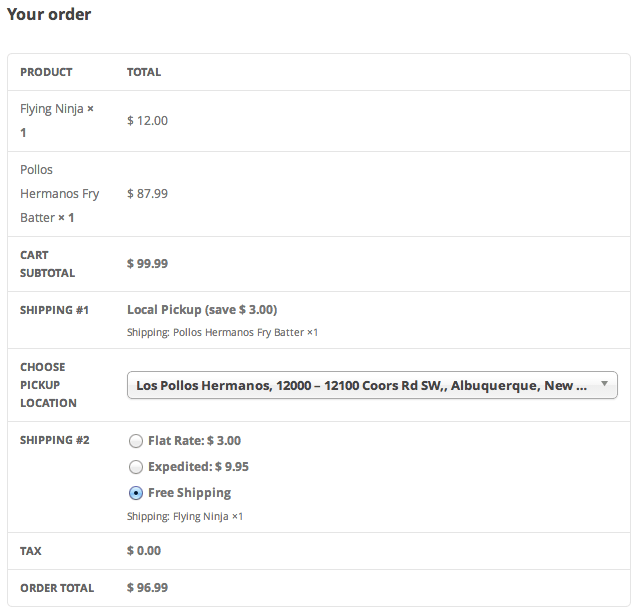 That happens to be where Pollos Hermanos was located in Breaking Bad. Gustavo Fring who owned Pollos Hermanos used the Fry Batter containers to secretly move crystal meth around the United States. You know a TV show is good if it makes it all the way into a screenshot for a WordPress shopping cart plugin.